The OS37-CF/OS37-60CF Series infrared thermocouples for high emissivity targets (non-metals and coated metals) and the OS38-CF/ OS38-60CF Series for low emissivity targets (clean metals) feature an internal adjustment screw which adjusts the 2% accuracy band anywhere within the overall temperature measurement range. All of these units use a lens to produce a minimum spot at a focal point. Models with 30° optics produce a rectangular minimum spot size in the focal plane by using a masked detector. Models with 1° (60:1) optics produce a more conventional round minimum spot size at a focal point. All models feature a built-in air purge. Example of pricing for popular models is referenced in the "To Order" box. Use the "Part Number Builder" below to get pricing for all available models. 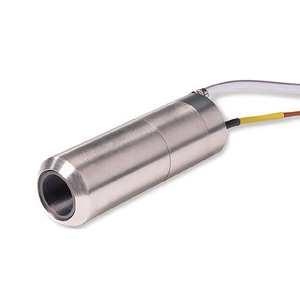 To order with GMP subminiature low-noise thermocouple connector pair, add suffix “-GMP” to model no. and add $12 to price. To order with GST standard size low-noise thermocouple connector pair, add suffix “-GST” to model no. and add $12 to price.